It was pointed out to me by a respected source that I didn't fully explain the benefits of a Zipcar membership. The source pointed out that Zipcars are available for short amounts of time for an inexpensive hourly rate. For example, the Honda Insight Hybrid I took out the other day would have cost $8 an hour so a 4 hour reservation would have totaled only $32. Secondly, the cars are available around the clock and can be reserved as little as a half-hour ahead of time and the reservation time can be extended by a half-hour or an hour or more depending on if someone else has the car reserved. Extending the reservation can be accomplished by a simple text message. Lastly, Zip cars are conveniently located in population centers of major cities as opposed to regular rental car agencies which tend to be located at airports or industrial zones. For example, I picked up both my cars in Westwood and the UCLA campus. 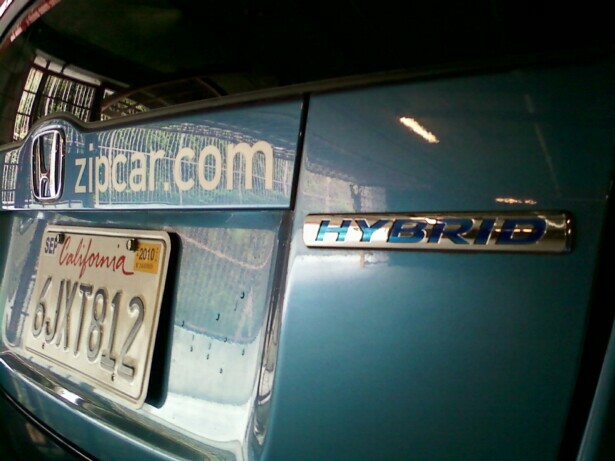 There are also Zip cars at the University of Southern California.